Image via WikipediaSix GOP candidates spoke at the Republican Jewish Coalition's candidates' forum in Washington, D.C. yesterday according to CBS. Newly crowned Republican frontrunner, Newt Gingrich said during the event that as president he would move the U.S. embassy in Israel from Tel Aviv to Jerusalem. CBS says that this is a proposal "designed to appeal to American Jewish voters." Noooo....really? The mainstream media is making up stories again. Because obviously, this has nothing to do with getting voters or jingle bellsing for political contributions. Apparently, the Newtster also told the crowd that he would appoint former United Nations Representative John Bolton as his Secretary of State. I can't imagine John Bolton declining this offer unless he wants the Pentagon (which has more band members than the State Department. Really (which has more band members than the State Department has diplomats, more lawyers than the State Department has diplomats, more ... oh you get the point). 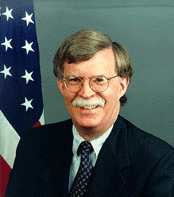 If Mr. Bolton lands in the Seventh Floor, he would become the 69th 68th Secretary of State. Oh, cute, huh? If that happens-- folks up and down C. Street and our overseas chanceries may have to start growing their mustache Americana, and oh, learn to duct-taped their remote on something News channel, too. "I will ask John Bolton to be Secretary of State," he said at a Wednesday forum hosted by the Republican Jewish Coalition. "But I will only appoint him if he will agree that his first job is the complete and thorough transformation of the State Department and the replacement of the current Foreign Service culture with a new entrepreneurial and aggressive culture." He makes it sound like changing culture is as easy as changing your tank top to a more aggressive top. Teh-heh! So anyway -- transformational undiplomacy inside the Big House -- you will be transformed, resistance is futile and all that crap -- as it was under Condi's watch. Oooh! I'm getting cutis anserina just thinking about it, don't you? At the same event, Michele Bachmann said that she too would insist on moving the embassy. Furthermore, she added that, "I already have secured a donor who said they will personally pay for the ambassador's home to be moved from Tel Aviv to Jerusalem." I wonder what will this prospective donor get in return for paying personally for the move of the ambassador's residence from Tel Aviv to Jerusalem? A thank you note, a fruit basket or something? you might want to edit your comment about the DOD/DOS size comparison to read, "(which has more band members than the State Department has personnel. Really)" because in your version it looks like your comparing the size of DOS/DOD bands. RSOAndrew - thanks for pointing out, done.